! Dr. Kucharski comes to us from an outpatient orthopedic clinic in Savannah, Georgia. He has earned his Exercise Science degree in 2007 and Doctor of Physical Therapy degree in 2010 from the University at Buffalo. Greg will offer our patients strong manual therapy skills (including spinal manipulation and tool-assisted soft tissue mobilization), sports performance and enhancement, functional analysis and pre and post-operative care. He is an active member of the American Physical Therapy Association. Dr. Kucharski is currently pursuing a certification in Kinesiotaping and is working on becoming a Sports Certified Specialist. When he is not at the clinic, Greg enjoys being active outdoors. 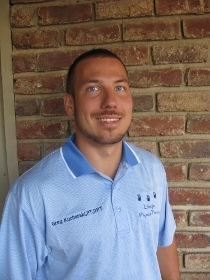 He is currently training for a half marathon in November and enjoys playing various sports including football, volleyball, hockey, and kickball. Originally from Buffalo, NY, Dr. Kucharski is an avid Buffalo Bills and Sabres fan. Dr. Kucharski is looking forward to treating the Lake Wylie/Clover/Charlotte community.